Let Diana Jewelers and Parle "Color Your World!" Platinum - More than just "Little Silver"
To Repair or to Upgrade? 57th Anniversary Total Stock Reduction SALE! Looking for a unique gift for Mom or Grandma? Diana Jewelers is, by far, the BEST place to shop for jewelry and jewelry essentials in Onondaga County! 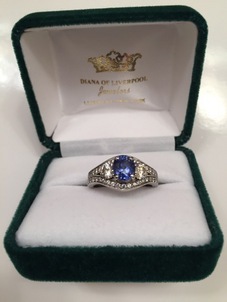 Color Changing Sapphire "Big Girl Ring"
Kirk Kara Engagement rings at Diana Jewelers! "I recommend Diana Jewelers and Christine to all my friends!" "I wouldnâ€™t hesitate to recommend Diana Jewelers to anyone!" "Trust this store for a fabulous demeanor and store employees- We love coming here!" "We will continue to use our only jewelry store." "Diana's Jewelers and their staff get a 5 Star rating"
"Betsy went the extra mile to try her best to fix my ring." "Betsy has worked with me one on one to make my own jewelry." Berco Jewelry is now at Diana Jewelers! Introducing Fingerprint Jewelry - the PERFECT Mother's Day gift! Introducing crystal travel jewelry from Diana & M-ercury Ring Corp! Check out our new Birthstone of the Month page! Don't miss our Valentine's Day special! Goodbye, Terri. We love you! Designer Sterling Day is THIS Sunday! I finally have my BGR (a.k.a. big girl ring!) It's been several years in the making but well worth the wait. I bought a blue sapphire several years ago and put it in a pendant. At the same time, I upgraded my diamond earrings that began as little specks in my ears. In November I decided it was time to create my own BGR. With Betsy's help, I ended up with my beautiful new ring that not only became a home for my sapphire, but for my diamonds as well. The best part, is that Betsy was just as excited as I was. She's the best. Thanks, Betsy.